A modern Thanksgiving classic about an immigrant girl who comes to identify with the story of the Pilgrims, as she seeks religious freedom and a home in a new land. As Molly nears her first Thanksgiving in the New World, she doesn't find much to be thankful for. Her classmates giggle at her Yiddish accent and make fun of her unfamiliarity with American ways. Molly's embarassed when her mother helps with a class Thanksgiving project by making a little doll that looks more like a Russian refugee than a New England Pilgrim. But the tiny modern-day pilgrim just might help Molly to find a place for herself in America. 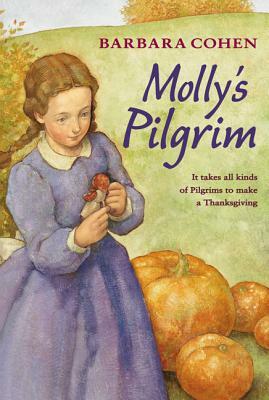 The touching story tells how recent immigrant Molly leads her third-grade class to discover that it takes all kinds of pilgrims to make a Thanksgiving. Originally published in 1983, Molly's Pilgrim inspired the 1986 Academy Award-winning live-action short film.